The Angkor Complex. I've seen, read and heard a lot of features about the temple complex ruins. I never really prioritized on visiting the city until one of my friends told me that it was one of the most beautiful places he's ever seen. With this in mind, it was off to Siem Reap, Cambodia. There are different kinds of admission tickets or what they refer as Angkor Pass. Depending on how extensive you want to go, you can pick from a day pass, a three day pass or a week pass. An important thing to remember is that you have to use the days pass on consecutive days. You can choose to visit the different temple complex on your own but I strongly suggest you hire a service of a tour guide. We rarely hire tour guide services when we go on trips but this time around we gladly did. The temples are filled with small alleyways and it can be quite confusing navigating around. Since there are a lot of temples in Siem Reap, the tours are divided into two, the Small and Grand Circuit. You can choose to hire a car but the best way to go is riding the tuk-tuk. We picked the three day pass and decided to take on the Small Circuit as this was the more popular choice among the two. Our first stop was the Bayon Temple, it is also known as the temple of faces. The amazing giant carved faces can be spotted on some of the towers of the temple. We passed by Phimeanakas and admire the architecture from afar. We decided not to explore the area anymore as the sun was scorching hot. Our guide told us that there weren't really any intricate carvings left inside the temple but it was the largest around the area since it served as the king's temple. It was nearly noon when we passed by the two terraces. The Terrace of the Leper King and The Terrace of the Elephants. The first terrace is known for its intricate carvings while the latter is known for the intricate elephant head sculptures that fronts the wall. Next up, we were off to visit a a temple where Angelina Jolie shot scenes for Tomb Raider. Ta Prohm is also known as the jungle temple. An amazing temple where you can see trees grow right on the temple itself. After having lunch, we visited the most popular Temple in Cambodia, Angkor Wat. Cambodians are very proud of this monumental landmark as it appears on their local currency and even on their national flag. The ruins of Angkor Wat was truly an incredible place. One amazing fact to remember about the temples are these were all handmade. This carved wall used to be covered in gold leaf. The huge blocks of stones has holes in it. Long Bamboo Poles were placed inside the hole and workers would manually carry the rocks with the pole on their shoulders. We were surprised to see buddha statues with lit incense around the grounds. Our guide told us that monks would regularly go there to pray. It was a pretty steep climb up to one of the towers. The next day we were off to visit more temples but this time around, we traveled further off the main complex. After travelling for almost two hours on a tuktuk. We arrived at the foot of the mountain of Kbal Spean. 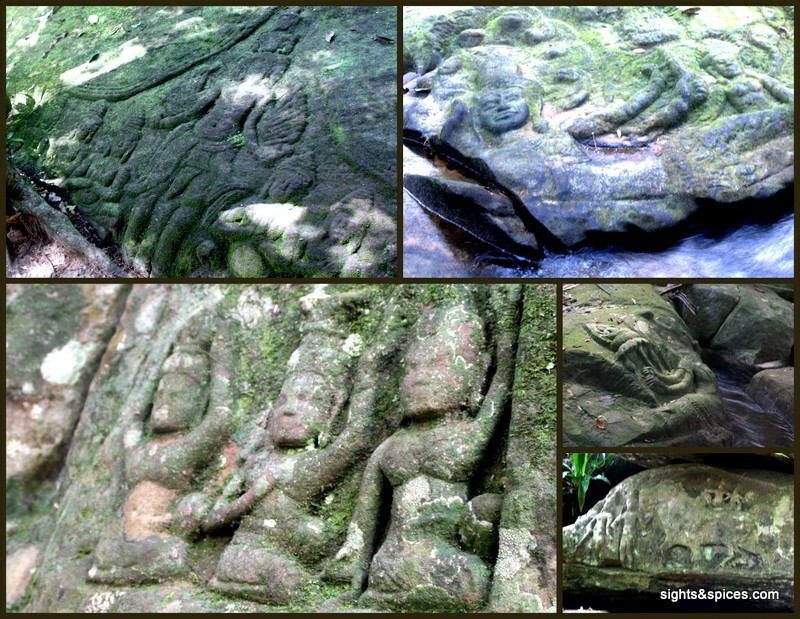 We had to do a 30 minute hike up the trail to reach the area where the carvings are. Upon reaching the top, my initial reaction was, is this it? We only saw a few carvings from where we are. Luckily a student volunteer approached us and asked us if we wanted to see more wall carvings. We happily obliged and he became our guide. He didn't ask for a fee but still we gave him tip after the short tour. You'll spot carved circular stones around the whole area. Also known as the River of a Thousand Lingas, the water that passes thru it is supposed to be holy. As the water is supposed to be holy, we saw locals taking a dip in the waters. Just a few kilometers from Kbal Spean was Banteay Srei, also known as the Citadel of Women. Though the temple is quite small, it has its own charm that makes it a must visit site. The intact intricate carvings on the yellowish/pinkish sandstone was beautiful. We initially didn't planned to visit the Landmine Museum but after reading about the museums's role on helping to improve the lives of landmine victims, we decided to make a quick drop by. The museum is really small and simple but after reading about what CNN's hero of the year nominee, Aki Ra has done and is still doing. We were glad that we visited the place as proceeds of the entrance fees goes to his Relief Center. Aki Ra is truly someone worth praising for. For more info regarding the Landmine Museum, feel free to visit their website at www.cambodialandminemuseum.org. Aside from visiting the temples, there is one more must do in Siem Reap. It has to be watching Phare, the Cambodian Circus. Held nightly on a big top tent, this was the perfect way to get rid of the temple burnout. The acts are very similar to the Chinese acrobats shows that I grew up watching. Though some acts were already familiar and the language used was in their local dialect, we had such a fun time watching. There are 8 different shows which they rotate on a daily basis. We enjoyed watching Sokrias (Eclipse) so much that we wanted to catch another show the day after if only time permitted us. A must do in Siem Reap!!! 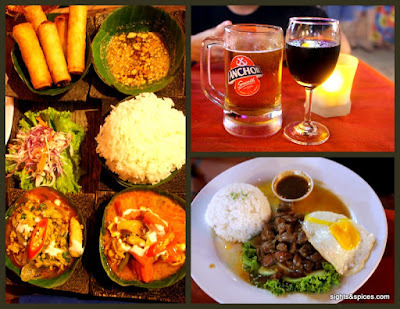 For our nightcaps, we always went to Pub Street and to its neighboring streets, alleyways and walkways. This place has it all, restaurants, shops, bars, clubs, massage places, street stalls, etc. If you want to watch a cultural dance show, you can head to Temple Restaurant. You can dine and watch for free. Spas and Massage Places can be found everywhere. Walk around the river at the end of pub street. Siem Reap is visited by millions of tourists every year but in spite of this, the city hasn't lost its local charm and culture. It is given that the temples are the reason why tourist come, people say that there aren't much other things to see. I agree that two to three days of visiting the temples is enough unless you are there to take dramatic shots of the place. But in my opinion, the best way to enjoy Siem Reap is to go along with the unhurried vibe of the city, just go with the flow and slowly absorb and enjoy the city's rich culture and history.